Robert Dahlstrom’s credits with Seattle Opera go back almost as far as Speight Jenkins; Dahlstrom made his debut designing scenery for The Ballad of Baby Doe in 1984, and has designed some 19 productions since then, including such memorable shows as Dialogues of the Carmelites ('89), Ariadne auf Naxos (’04), Tales of Hoffmann (’05), and Don Giovanni (’07). 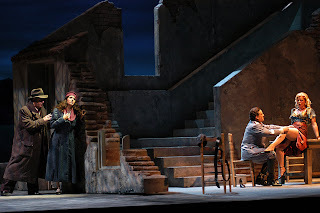 For Lucia di Lammermoor he, together with Stage Director Tomer Zvulun (photo, right, by Aubrey Bergauer), is adapting the scenic design he created for I puritani (’08). I checked in with him last week as he was heading in to a meeting about the designs for The Magic Flute coming up next spring. Bob, or should I say “Professor Dahlstrom” [Dahlstrom is now Professor Emeritus of Scenic Design at the UW School of Drama], this Lucia presents a somewhat unusual situation: not a scenic revival, but an adaptation. Can you explain how you transformed the set for I puritani into one for Lucia? Jon, it's Professor only in material published by the University, it's Bob at the opera. Let me share with you a little anecdote. 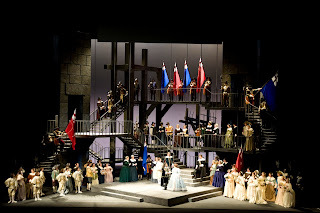 When we first saw the Puritani set up on the stage, two seasons ago, we sat in front of it and said, okay, this is like a Shakespeare festival stage: a unit set that provides for a great many locales and a great many places where scenes could focus. It was made for I puritani, which it served very well, but the first thing we said was “We could do all the Shakespeare operas here.” Adapting it from I puritani to Lucia, it becomes our “Mad Lady” Set. What makes it a good set for Shakespeare? 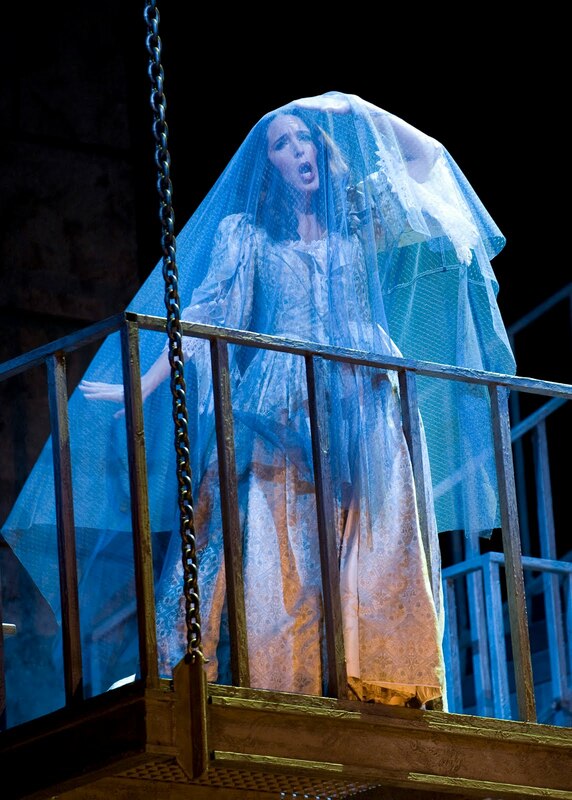 With all the levels and platforms, it provides places for action to occur, between two singers, that can be observed by others singers who are visible to the audience but not visible to the characters who are singing. Thus there are lots of possibility for lurking, eavesdropping, overhearing. And what makes it a good set for “Mad Lady” bel canto operas? One of the things that was important to Linda Brovsky, who staged I puritani, and that Tomer [Zvulun, stage director of Lucia] also wants, is the possibility we have here for extended movement without repeating one’s path. A long entrance allows a character purposeful extended movement while he or she is singing and revealing character. In Puritani, for instance, Arturo makes a grand entrance, preceded by pages in white satin. He sings for a long time, and the route he takes allows for musical and dramatic accumulation, on his way down to meet his bride. You’ve done scenic adaptations in the past. For our most recent Rigoletto (’05, directed by Brovsky, set in Mussolini’s Italy) you updated to the 1930s sets which you had originally created (in ‘87) for the time of the story (early 1600s). Rigoletto was an adaptation of an adaptation! I had designed a production of Massenet's Manon in 1985. Rigoletto 1.0, in '87, used structural pieces (stairs and platforms and things) from that old Manon set reconfigured to show the locations called for in the libretto. It used background imagery from the Palazzo del Te, outside of Mantua, the beautiful frescoes there. Then, for the next Rigoletto, in 1994, we changed some of the backgrounds and added a big red curtain which related differently to each scene. Then came Rigoletto 3.0. Speight asked us to do something totally different, and Linda Brovsky got the idea of the Mussolini period and the anti-semitic legislation in Italy at that time. We put some phone wires and that sort of thing over Rigoletto’s house and made some new backgrounds; none of the drops from Rigoletto 1.0 survived in that production. 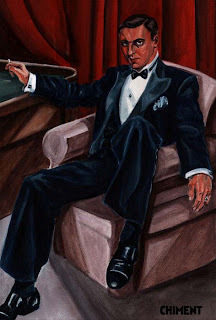 We used the big red curtain differently, I figured out a way of reversing the viewpoint on the Duke’s palace for Act Two, plus there was this fabulous Tamara de Lempika image being painted (left), in the first scene, that looked extraordinarily like Frank Lopardo [who played the Duke, below right photo by Rozarii Lynch]. But those Rigolettos and this Lucia start with totally different ideas about making stage pictures. Rigoletto was illustrative; we were trying to represent several separate named locations: the Duke’s palace, Rigoletto’s house, the tavern at the river. For Lucia/Puritani, we make a machine for performing the opera that allows us the movement possibilities we need, and then add a very few new elements to each scene to locate it specifically: a fountain in the park, a private room, a great hall in a castle. 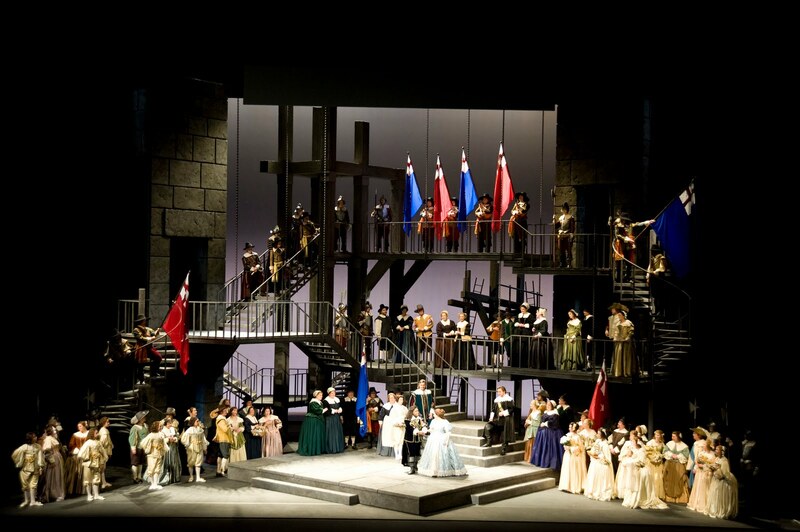 The crazy staircases in the I puritani set reminded some of Hogwarts Castle in the Harry Potter films. 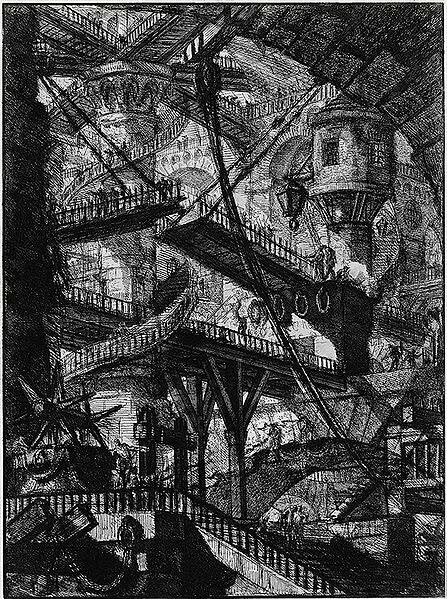 But I remember you saying the original inspiration for both were the Carceri etchings of Piranesi. Yes, Piranesi [1720-1778] was this architect in Venice and Rome who couldn’t get anybody to build anything, so he went into doing sumptuous etchings of Roman ruins and sold them to English tourists--you know, all the milords doing their Grand Tour would take his etchings back to their country house in Surrey. These were primarily decorative. But he then went into, as did Guardi and Cannaleto, cappricios, invented landscapes or architecture. 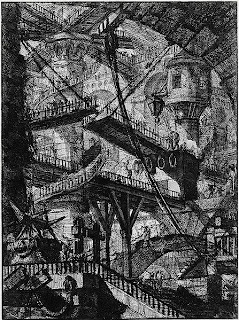 The carceri, the prisons, are Piranesi’s invented series. They may have had those in mind for Hogwarts, yes, and certainly Mervyn Peake’s Gormenghast--carcinogenic, metasticized architecture. At the beginning of the nineteenth century, as spoken drama and opera headed into Romanticism, the prison became a ubiquitous locale, so designs for prisons were very important. This is the period of Salvator Rosa’s dark, mysterious, threatening forests; the Alps, for example, at this time went from being seen as a nuisance, an obstacle to travel, to being an object of almost sacred exaltation. 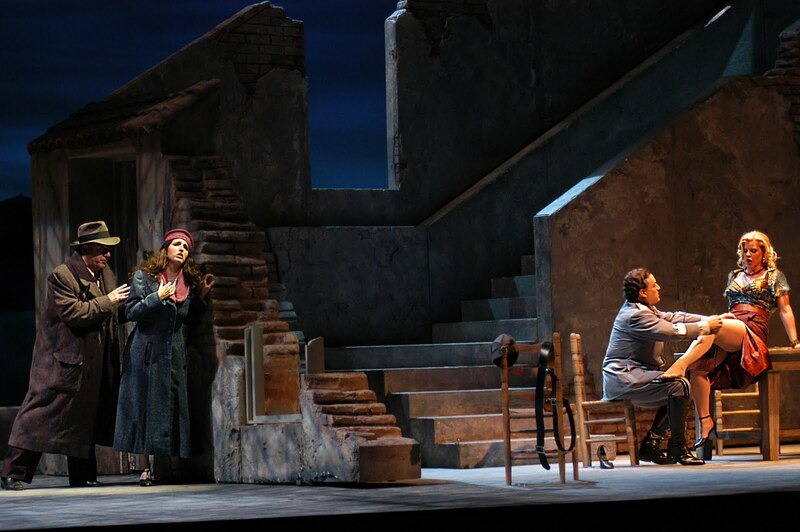 What’s it been like working with stage director Tomer Zvulun on this Lucia? I first worked with Tomer when he was a wonderful assistant director for the company. 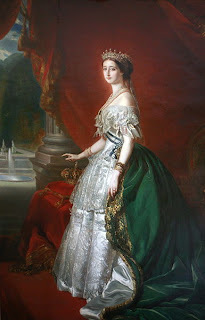 Of course, for Lucia Tomer wanted to make it as much a new production as possible, but the financial situation has necessitated simplicity. But he has a very sound and creative directorial instinct, basically he wants stuff singers can use, climb, hang onto, try to open, and he wants it to be very clear to the audience, for each entrance and exit, where people are coming from. And working with your old friends down at the Seattle Opera Scenic Studios? They’re great. The different scenes in the opera feature many different configurations of stairs, and that was fascinating, building a sort of “Lego Kit” that could work in many combinations. And one of things we came up with for this production is this imposing portrait of Lucia’s dead mother. Since we’re setting the opera in the period of composition [the era of Walter Scott and Donizetti, not feuding Renaissance Scottish clans], for our model we chose an 1860s painting, by Winterhalter, whose portrait of the Empress Eugenie and her court ladies is one of the monuments of mid 19th c. painting. At the shop they print the portrait full-scale, put a scrim over that, and then draw the image onto the scrim and paint it. It’s the same process for that astounding drop they made for Tales of Hoffmann. And yes, since it’s a scrim of course at some point in the show we’re going to see something else through the portrait! I espedcially liked the ways you described of using the items in a set for one production in a set for other productions!!! This is something I have been advocating here in Germany, where government-subsidized theaters are on tightening budgets due to governments over here being pinched financially the same way they are in the States -- but nobody over here seems willing to consider this way of extending a budget for sets by reusing the elements from past productions.